Fire officials say gusty winds and drifting snow contributed to the morning collision between a bus load of Derry kindergartners and a passing car. 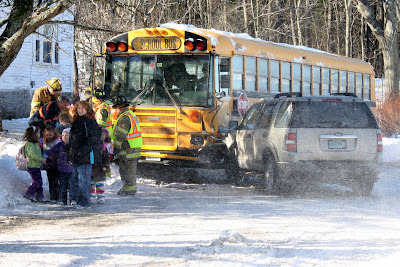 A Ford Explorer rounding a curve at the intersection of Lawrence and Island Pond roads slid into the front side of the school bus just before 11:30 a.m. on Thursday, said Derry fire Lt. Derek Lunberg. All four people inside the sports-utility vehicle — two adults, a young child and an infant — were transported from the scene to Parkland Medical Center in Derry as a precaution, Lunberg said. None was seriously injured, he said. Superintendent Mary Ellen Hannon and other school of­ficials went to the scene Thursday morning to wait with the children.